25 Nov, 2014 par F.P. 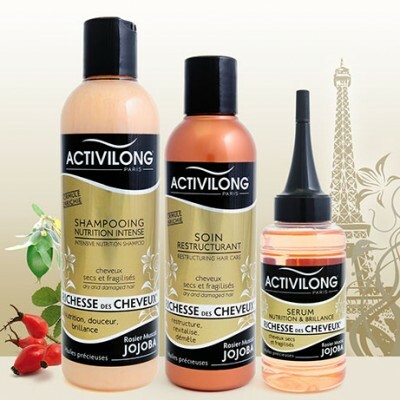 We did not resist the temptation to save you the products of “Hair Wealth” range of Activilong. Be among the 50 winners by responding quickly to two simple questions. For you to be the best for the holiday season, the brand specialized in hair since 1983, built a luxury line for hair from all backgrounds. A Femmesaupluriel.com we love! At the heart of this care two flagship products: the precious Rosehip oil (moisturizing and regeneration of the hair fiber) and Jojoba (natural emollient and shine). You may also refined, floral and musky scents associated with satin and rich textures that transform daily acts of genuine beauty ritual. Intense Nutrition Shampoo with a Restructuring Care and Nutrition & Shine Serum, hair regains vitality and beauty in 3 simple steps. To receive, at home, from December 8, this new luxury range and Nutrition, simply to respond quickly and appropriately to the two questions. Your turn! 1- Quels sont les actifs de la ligne Richesse des Cheveux ? 2- De combien de produits se composent la gamme Richesse des Cheveux ?